Freeview Play update brings on-demand viewing to live TV | What Hi-Fi? It’s the first time Freeview has integrated on-demand content into the TV guide. 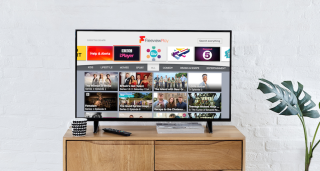 While Freeview Play has combined Freeview TV channels with the the UK's catch-up TV apps since its inauguration in 2015, only now is the service integrating on-demand content into the live TV experience. Freeview has this week launched a dedicated Channel 100, where users can see curated content recommendations from BBC iPlayer, ITV Hub, All4, Demand 5 and UKTV Play. Content across its ecosystem of on-demand services can also be searched for via a universal search bar. The dedicated discovery channel is accessible from the TV guide, which according to Freeview research is still the most popular way viewers access shows. Set-top boxes and TVs with Freeview Play, such as Humax's FVP-5000T box and many sets from LG, Panasonic, Hisense and Toshiba, should be able to access the channel now, with Sony and Philips TVs that support the service set to receive the update later this year.